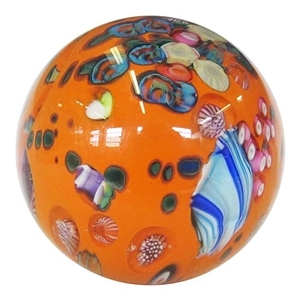 Handmade contemporary art glass marble by artist, Bobbie Gaspers Seese. This is a signature style by Bobbie where she captures end pieces and scraps of canes, latticino, and filligrana in a base of opaque orange. The scraps sunk into this orange base resembles an Alien planet or the floor of the sea. Approximately 2" in diameter. Signed and dated by the artist.